The method for insertion of images has changed to give you greater control over your Flickr photos. The save button will update the photo information directly on Flickr. 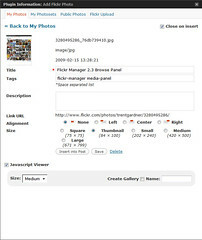 When inserting a photo, the title field will reflect the caption to be displayed in the Lightbox or Highslide overlay (No save is necessary for this to take effect). Finally this update includes some security updates which address several vulnerabilities, and it’s highly recommended that you upgrade. Please forgive a newbie basic css question, but I can’t find where or how to hard-wire border and margin info so we don’t need to do it with every photo. Thanks! Is there a way to revert back to the old version? The whole reason I loved this plugin was the ability to insert multiple photos very quickly by unchecking the close on insert button on the main page, clicking on the photos, choosing the sizes, and having them be inserted very quickly. Now the whole process takes forever and I’m really bummed! I loved the old way the plugin used to work and I hope there is some way for me to have it like that again because I would really like to keep using it. There’s an archive of all previous versions. Hello, I was looking to see how I may go about modding the plug-in so that it can display my “favorites” or “groups” feed instead of my flickr feed? I notice the photo url and profile url within the settings but see no option on editing that. Jst needing to know where, if possible, to look in editing this for my end purpose. JoJo.. It can be done, but not easily..
http://www.flickr.com/services/api/ is a good starting point.. It’ll require rewriting a large portion of the plugin. 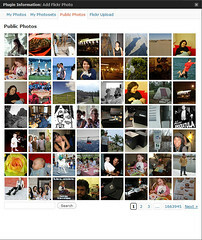 Ok, I was able to modify it so that within the settings panel, the Photo URL and Profile URL can display and link to my flickr “favorites” page. But on my WP page itself, it is still only displaying my main flickr feed. Thank you for the link to the API, I am now beginning to sift through it. But by chance would you know what line(s) of code, in your plug-in, that tells the manager what to display? Maybe I can alter that “address link” of which it is requesting images from. This is the ONE, minor yet major feature I and a few others feel that this Plug-in is missing. If it had this it would be that much more of a killer plug-in. Thanx a bunch for your work! It is already an excellent plug-in! I just found your plugin today. I just had a couple quick questions and pardon if you’ve answered them millions of times. 1) Are you planning to add a batch uploader? Or simply integrate with the Media browser in WP2.7? 2) Do you plan or is it possible to create photo sets in the manager rather than on flickr? The reason I ask is I’m trying to make it a one-stop destination for uploading photos for my inexperienced users. Looking to set up some gallery pages that feed off my Flickr account; I don’t see anything in this about the plugin working with pages in WordPress though, only with posts. Is this just an oversight in the descriptions, or is it actually implemented just for posts? I have the same issue with lenna. The old version provides quickly insert multiple photos, but new one can not, very slow, busy on page switching. Maybe next version provide the old style and new? I do not think I changed any settings in flickr or wordpress. And it is still working for older pictures. Do you have any hints what might be causing this behavior? Thanks in advance for this terrific plugin. Doesn’t seem to want to work with WordPress 2.8….any idea what the problem may be.. I am going insane with this latest version of wordpress, a number of the plugins I use, including your flickr either do not work or require hacks to fix ’em. I get to Photosets>Insert Set> and choose the settings I want, but the “Insert into Post” does nothing on both IE and Firefox. I know this has everything to do with WP 2.8, I love your plugin and want to continue using it. Do you have any hack suggestions? Or would you be able to update to 2.4? Hi! Absolutely love your plugin and have been using it a lot to insert pictures into my travel blog. However after I updated to the latest version I have been unable to do so. When I open the flickr manager I can select my pictures alright and get to the next screen of choosing size and position, but after that when I click insert picture the screen just reloads and nothing happens. Any tips on how I can solve this as I’ve become quite dependand in your plugin! Keep up the good work and hopefully an update soon? I agree with John, I cannot get this to work with 2.8 for some reason. I’ve tried with IE and Firefox. I will have to do it by hand until there’s a patch. Love this plug-in, don’t want to lose it, but, I want to be able to utilize it. Hey everyone with the complaints. How about this: Donate a token of your appreciation. Hey Man, I’ve always enjoyed using Flickr Manager, but it seems since I have upgraded to 2.8, it doesn’t work. The menu comes up that allows me to choose a photo, view all the metadata, choose a size and alignment, but when I click the insert in post button, nothing happens and the window stay open until I close it. Will you be working on this, or is it time to look for another plug-in? Just curious, because I really like this one. Plugin has been a true joy, nice and smooth. Yesteday I finally updated my WordPress to the latest version and suddenly the plugin won’t reason at all. Is there an plugin update on the way? Yes looks great but doesn’t work with 2.8.4 – It grabs the image and all is great but insert in to post doesn’t work at all on Mac Safari or FF. Shame as it is exactly what I need. PS: My WordPress version is 2.8.4. I went through and installed versions 2.2 – 2.1 of WordPress Flickr Manager… no luck. After installing the 4 versions, then attempting to insert a Flickr photo… hovering my cursor over a thumbnail or clicking on a thumbnail… nothing happens. I thought I was the only one that had the same problem with WP 2.8. It just won’t add the photos, it doesn’t close the manager, nothing! I was really excited, but I can’t make it work for me, I don’t dare touch the css, because I am useless with it.. Any chance this might work at some point? I am in the same boat as John. Looks like when you click insert photo it looks like its going to work. Then never imports the photo. Hello Trent, I updated to the latest version of WordPress and now I can’t insert my sets into the post. Any suggestions? I am also running version 2.8 and it does not work. It will upload a file to flickr but it will not insert it into the actual post. The window will not close either, you have to close it manually. Weird. Any ideas as I would love to use this plug-in. I have a slight problem with your otherwise excellent plugin. If I use the create gallery option to add flickr pics to a post and then add captions to those pictures the output html is broken. What happens when gallery is used is the P tags are output with nothing between them and the actual paragraph text is output after the caption div without the p tags. This results in the paragraph associated with the picture having different formatting to other paragraphs due to it not being in the p tags. This behavoir ONLY occurs when create gallery is used OR if you add a gallery code [mygal] to the image link-rel flickr-mgr atribute. I got the same problem, that it dosn’t insert the photos on my WordPress 2.8 installation. Any fix to this problem ready yet? I use this on my personal blog (v 2.7) and now I’m trying to add it to a new blog (v 2.8.4) and it won’t publish the photos to my post. How painful! Any chance of you updating this awesome plugin? I was also wondering if you have any plans to upgrade the plugin to 2.8 compatibility…I sure like it, but I have to use something that can work with 2.8…? Lightbox does not work with this plugin on my blog. Can you please give me a hint, what could be the reason? first of all, thank you for this plugin. i have been using it for a long time and appreciate it very much. i recently upgraded my wife’s blog to wp 2.9.1. when i did so, it “broke” the plugin (v2.2). i tried upgrading the plugin version but the same issue persisted. i was able to get it working 100% again (both versions). I’m using WordPress 2.9.1 and Flickr Manager 2.3 and Safari 4 on Mac OS X 10.6 … when I select an image to insert in a post and click the “Insert into Post” button the view refreshes (loses my form selections) and nothing is inserted into my post. Update … same results with Firefox 3.5 on Mac OS X so I don’t think it’s a browser thing. Fantastic plugin. Do you have any suggestions on how to add an Event Tracker to the lightbox? Having issues with 3.0 version of wordpress. The post simply doesn’t get inserted at all. Please update it for the latest version too. After pressing the insert button, nothing happens. The upload window gets reloaded without actually inserting the image in the post..
Hi, thank you very much for the great plugin! I really like it and I now use it for a while. One little question: I just saw that, when I add a gallery, always all pictures in that gallery are included in the wordpress article. No matter which privacy settings single pictures amongst those have on flickr. I have some few “private” pictures in nearly every album. Thus, it makes life very difficult for me: I cannot use Embed album any more. Any idea how to solve this! V 2.3 was last great version. Will not update until I can see images in the editor again (shortcode only? but WHY? ).